Ministry of Micro, Small & Medium Enterprises (MSME), Government of India has awarded Mr Basant Kumar Khetan with the prestigious “Best Entrepreneur Award” for Outstanding Performance in MSME Sector in North Eastern Region. Mr Basant Kumar Khetan is the Director of Neccon Power & Infra Ltd., and Pro-Chancellor of The Assam Kaziranga University, Jorhat. Mr hetan has received the award on 27th of June 2017 on the occasion of National Awards Function – 2015 on the solemn occasion of the United Nations Micro, Small and Medium – sized Enterprises Day at Pravasi Bhartiya Kendra, New Delhi . The event was graced by Honourable dignitaries Giriraj Singh, Hon’ble MoS, MSME, Haribhai Parthibhai Chaudhary, Hon’ble MoS, MSME, and Kalraj Mishra, Hon’ble Union Minister of MSME. Mr Basant Khetan has dedicated this award to the leadership of Dr M.D Khetan, guidance of Mr. J P Khetan and support of Mr. Pradip Khetan which has made it possible for Neccon Infra Ltd to achieve such heights and him to be honoured with this prestigious award. Neccon Power & Infra, founded by Dr M.D. Khetan in 1986 started with the manufacturing of overhead transmission AAAC/AAC/ACSR conductors up to 400 KV lines, which eventually led to the establishment of its second manufacturing unit at Sikar, Rajasthan in 1990. The company soon spread its wings in the international market and got deemed export and export orders worth 5000 Lacs. To further penetrate in the power sector, the company diversified in EPC/Turnkey Project activities like Supply, Erection, Construction & Commissioning of 220KV, 132KV, 33KV, 11KV, Sub-Station, Transmission and Distribution Lines under ADB, APDRP, RGGVY, ABY Scheme, TDF on Turnkey Basis specially in the states of Assam, Jharkhand, West Bengal, Tripura and Rajasthan. Lauding the efforts and achievements of NECCON Power & Infra Limited is in line with the realization of the commendable goals of “Make in India” and “Zero Defect Zero Effect” set by the Hon’ble Prime Minister of India, and the faith and confidence he has so justifiably reposed in the MSME Sector. 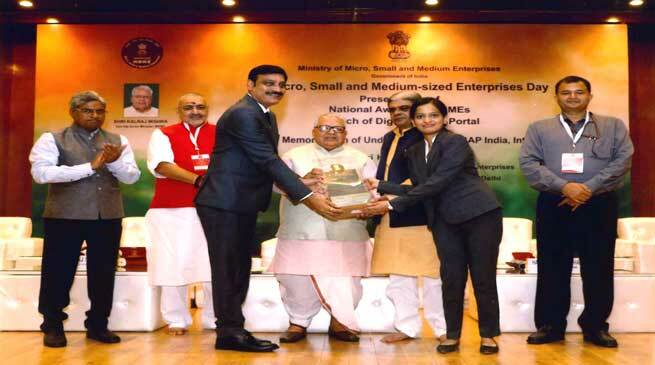 The Ministry of Micro, Small & Medium Enterprises has honoured Neccon Power & Infra as a token of their special contribution to, and efforts in the MSME sector – an achievement that is bound to motivate other MSMEs.